Faculty colleagues and I often bemoaned that there seems to be a consensus that writing skills among MBA students have been declining. I’m not talking about flowery prose and precise grammar. I’m talking about logical argumentation … being able to explain why something is happening and what to do about it. My hypothesis was that colleges aren’t requiring students to take courses (or demonstrate proficiency) in, say, critical thinking or logic … and that college students today aren’t required to write many papers that hone their thinking and writing skills. 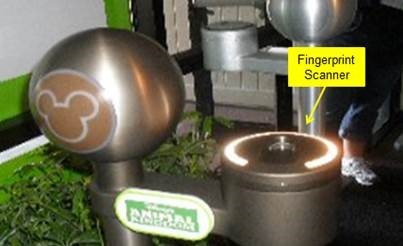 In prior posts, I gushed over the technology applications at Disney World … and recounted the plausible explanations for why Mickey digitally records guests’ fingerprints when then enter the park. Ostensibly, the purpose is fraud protection – keeping folks from passing along their partially used tickets for reuse. Of course, there are other sorts of uses for digital fingerprints (e.g. catching bad guys) … and ways that the information can be misused. 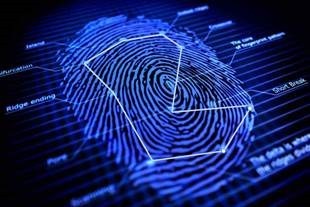 With my curiosity aroused, I did some digging re: digital fingerprints. More Disney: Why is Mickey fingerprinting me? A plausible “why” and a very interesting “how”. In a prior post Seriously, why not outsource TSA ops to Disney? , I gushed over the technology applications at Disney World … the Magic Bands than let me into my hotel room & the park, Fast-Passed me to the front of lines, and “personalized” my family’s experience with real-time greetings and photos. I noted that I was digitally fingerprinted when I entered the park and asked if anybody could tell me why. A couple of loyal readers clued me and provoked some digging. Last week, I took a fact-finding trip (aka. 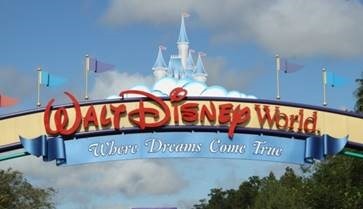 family vacation) to Disney World. Once again, I was blown away by the park’s technology and security operations …. No surprise, there was a huge rush of “guests” entering the Magic Kingdom when the gates opened at 8 a.m. The crowd measured into the thousands … all needing to be security-screened. All bags and strollers had to be hand-checked … all kids – big & little – had to be ushered through metal detectors. Maybe at the airport, but not at Disney. Our wait & processing time: less than 10 minutes. Though I’ve retired from the practice, I’m still very engaged on education issues … especially whether our students (at all levels) are being adequately schooled to compete in the real world. So, one of my summer reads is “What Schools Could Be” by Ted Dinterersmith – a well credentialed, experience-deep educator. In a nutshell, author Ted Dintersmith spent a year visiting schools across the nation to identify outstanding teachers and catalog their secret sauces. One of the anecdotes that he recounts in the book hit one of my longstanding questions: Do students really learn what they’re being taught? How much “learning” is lost during summer vacation? In his book Outliers, one of the topics that Malcolm Gladwell explored was the academic achievement gap between kids from low income families and kids from higher incomes families … even for kids attending the same schools. Malcolm uncovered a learning dynamic that he coined the “summer slide”. Since 1982, women have earned 13 million more college degrees than men. What do colleges have in common with Kohl’s? I oft say that anybody who pays sticker price at Kohl’s should look over their shoulder to make sure that Darwin isn’t chasing them. Maybe the same should be said of parents who pay list price tuition to fund their kiddies through college. 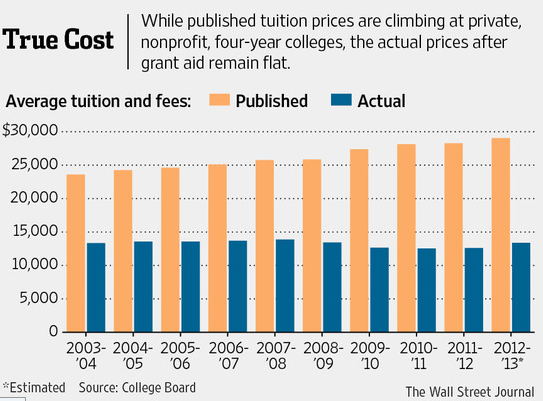 Lots of talk re: how college costs are soaring. Published tuition rates have soared in the last decade, but only a small percentage of families actually pays full freight. Between grants to needy students and merit scholarships to entice other desirable candidates, schools these days are giving back nearly 50% of gross tuition revenue in the form of aid and awards. In other words, list prices are going up, but more stuff is being sold at sale prices. Should colleges be forced to underwrite student loans? Sounds like a logical, easy fix, right? Yesterday, we posted about the $1.5 trillion in outstanding student loan debt held by about 45 million former students. We argued that that’s a problem because (1) The student loans fuel tuition increases by enabling colleges to fund inefficiencies (2) Servicing the debt load constrains borrowers lifestyle choices (e.g. marriage, home buying) by crowding out other debt capacity, and (3) When interest rates rise (and, they eventually will) repayment will pose an increasingly difficult challenge for many (most?) borrowers. 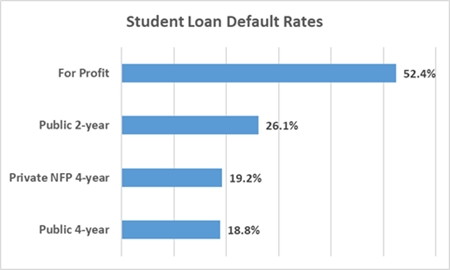 Following on that last point, the default rate on student loans is about already 20% on average … with big differences by the type of school the borrower attended. One of the byproducts of the recent college admissions scandal has been an elevated look at college attainment (i.e. what are students really learning) … and ballooning student debt. Last week we looked at what students are really learning. Now lets shift the spotlight to student debt. 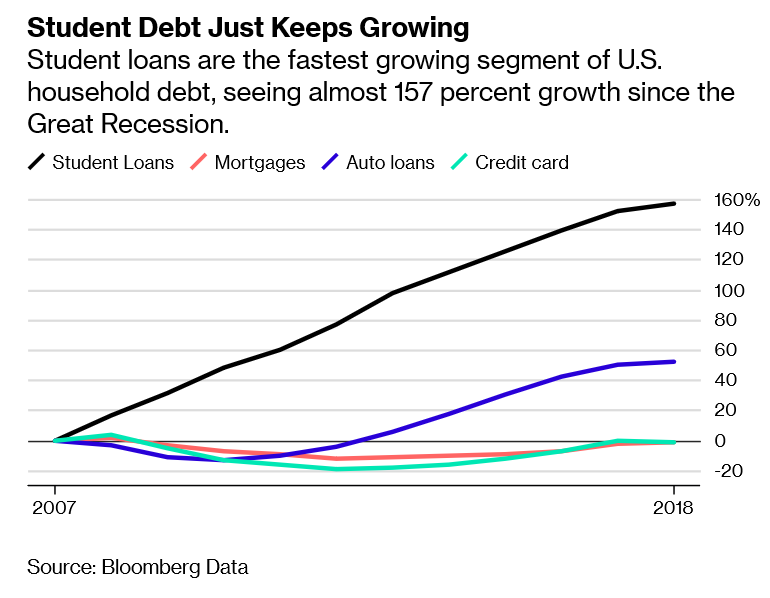 Student debt has more than tripled since 2004, and is now over $1.5 trillion — second only to mortgage debt — and higher than both credit cards and auto loans. That’s a problem because (1) The student loans fuel tuition increases by enabling colleges to fund inefficiencies (2) Servicing the debt load constrains borrowers lifestyle choices (e.g. marriage, home buying) by crowding out other debt capacity, and (3) When interest rates rise (and, they eventually will) repayment will pose an increasingly difficult challenge for many (most?) borrowers. Last week, we looked at the ACTA college ratings. They evaluate a school based on whether (or not) they require that students take courses (or demonstrate proficiency) in core subject areas such as math, science, and critical thinking. And, ACTA reports scores on how well schools deliver on freedom of speech and diversity of thought. 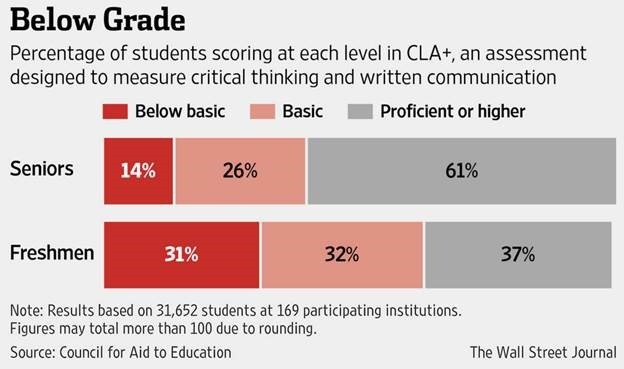 Bottom line: few schools receive stellar grades. Here’s a site that you must check out. In a prior post, we questioned: “Are colleges watering down their curriculums?” … and reported on a survey conducted by American Council of Trustees and Alumni. The ACTA criteria and methodology specifically assesses whether students are learning the “essential skills and knowledge” for work and for life. The results: Only 2% of the surveyed schools earned an A grade from ACTA. The overall statistics are interesting (and disappointing), but what’s more meaningful is how specific schools are doing. A survey of 700 schools answers the question. In a prior post, we outlined the criteria and method that the American Council of Trustees and Alumni (ACTA) used to assess whether students are learning the “essential skills and knowledge” for work and for life. In a nutshell, ACTA researchers culled through over 700 schools’ course catalogs and web sites to determine what courses were being offered and, more important, which courses were required of all students. A survey seeks to answer that question. In a prior post, we reported that employers think that most college graduates are poorly prepared for the work force in such areas as critical thinking, communication and problem solving. Let’s dig a little deeper on that sentiment. The American Council of Trustees and Alumni (ACTA) conducted a survey of “Core Requirements at our Nation’s Colleges and Universities” to determine what students are really learning in college. Specifically, the ACTA survey focused on the courses that a student is required to take outside the major. These courses — commonly called general education classes or the school’s core curriculum — are, according to the ACTA, “ the foundation of a school’s academic program”. They are the courses “generally designed to equip students with essential skills and knowledge” for work and for life. Employers say that 9 of 10 college grads are poorly prepared. 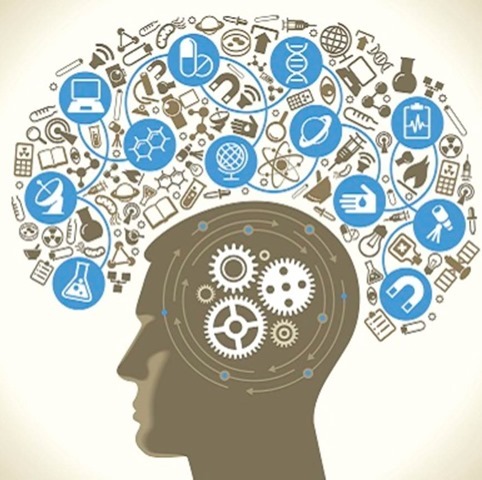 9 out of 10 business owners surveyed by the American Association Colleges and Universities said that recent college graduates as poorly prepared for the work force in such areas as critical thinking, communication and problem solving. Are employers being too critical? College admissions scandal: Much ado about nothing? Maybe so, but it shines a spotlight on other college problems. 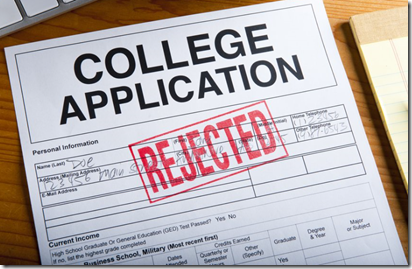 It was easy to get caught up in the recent college admissions fiasco. It had all the ingredients of popular scandal: rich celebrity stars and industry titans, elite colleges, outrageous (and illegal) adult behavior, sports abuses, social injustice. All constantly re-fueled by continuous cable news looping. Today, let’s step back and put the bruhaha into perspective. Busting the admissions cheaters is the right thing to do, in addition to being emotionally satisfying. But it won’t change America’s colleges much for the better. That’s a conclusion the the NYT editorial staff reached. But that conclusion was apparently tough for the Times to swallow, so the editors pulled a Comey in their editorial. Remember when Comey said: “Here’s a list of all the laws and policies that Secretary Clinton violated, but no reasonable prosecutor would indict her”? Well, the Times – apparently still grateful for the memo that Comey leaked to them to get the special counsel rolling – styled their editorial after his Clinton ruling. After the obligatory reaffirmation of Robert Mueller as “a man whose name is synonymous with integrity and fairness”, the Times reheated all of allegations about collusion and obstruction that Mueller decided didn’t merit indictment. The Times conceded (I think) that the investigation was ‘by the book’ and fair. William Barr, the attorney general, needs to release as much of Mr. Mueller’s work as he possibly can, and soon. All Americans deserve the chance to review those findings and reach their own conclusions. Whatever happened to “turn the page”? The simple answer is ‘yes’, but it’s more complicated than that. 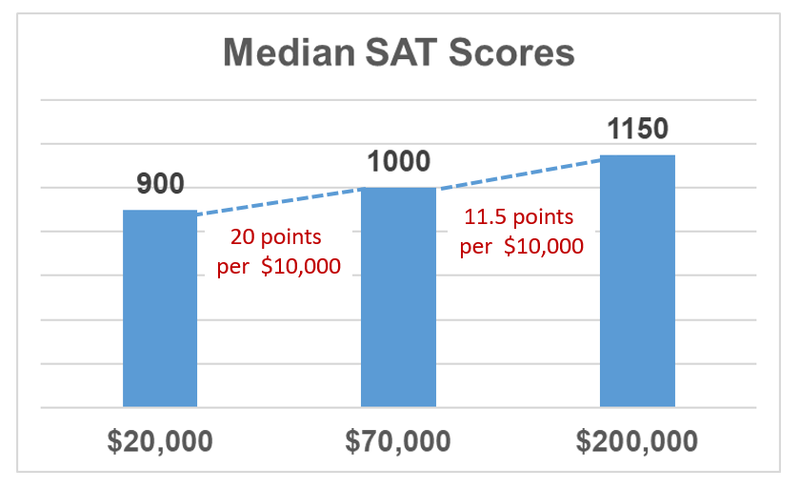 There is a statistically significant relationship between family income and SAT scores. Since SAT scores are in the news, here’s some perspective. The College Board publishes a “Total Group Profile Report” for college-bound seniors. Browsing it, a couple of sets of numbers caught my eye …. Let’s start with math scores. (2) Scores for both boys and girls have been falling for the past dozen years or so. 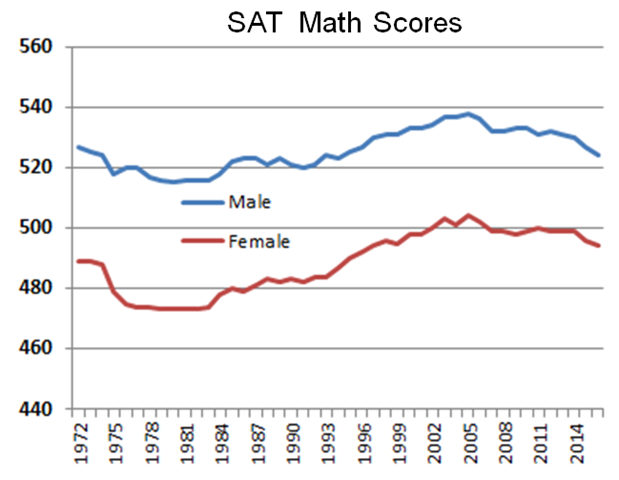 OK, boys outscore girls in math, but girls do better on the verbal part of the SATs, right? How to get your kids into good colleges … without cheating or bribing. There’s a sure-fire method, but it isn’t easy. It’s called parenting. 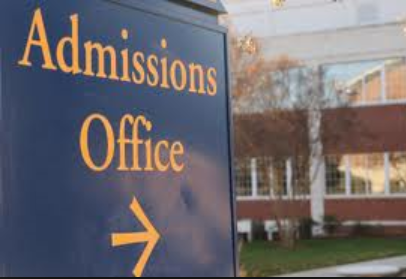 Last week – in the wake of the college admissions scandal – we posted about how Asian-American students are being admitted to highly selective (aka. ” elite”) high schools at increasingly high rates. Because they are academic achievers. In part because Asian-American parents place a high priority on education, drive their children to excel (especially in STEM academics) and provide their kids with extensive extracurricular learning experiences (well beyond SAT prep classes). And, oh yeah, they’ve probably gone to college … providing good role modeling and ready tutoring capabilities. SAT scores by the student’s parents level of educational attainment. 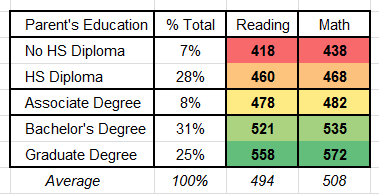 Note that about 2/3’s of the college-bound seniors taking the SAT came from homes with a degreed parent – either associate, bachelor or graduate. Only about 1/3 came from homes with parents having only a high school education or less. Or, the more pertinent question: Are Lori’s daughters “qualified” to attend USC? 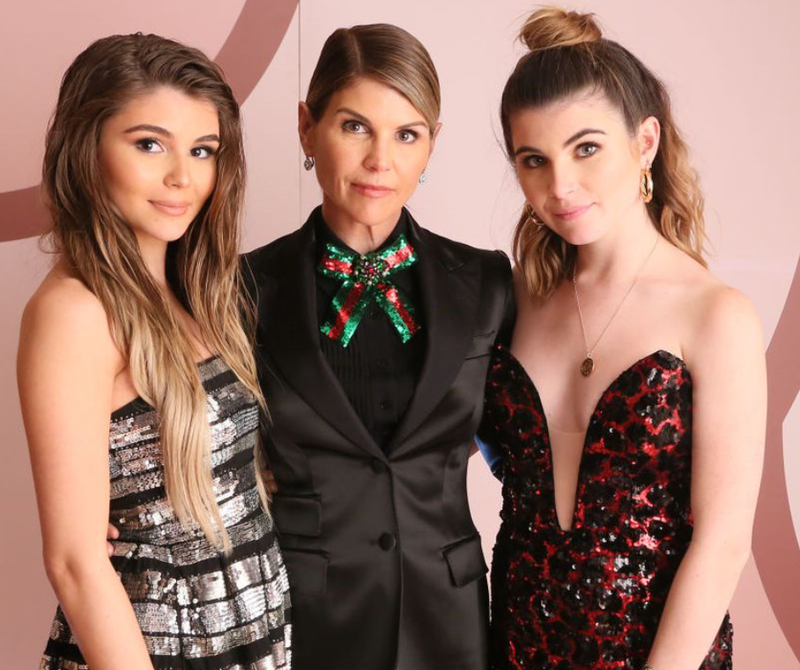 I hate to pick on Lori Loughlin’s daughters (<=not really) but, in the recent college admissions scandal, they’re the only kids who have been outted (in detail) by the media … and, let’s be honest, they are easy targets. it took a whopping $500,000 to open USC’s “side door” for the girls — that suggests that the girls had a lot ground to make up. Lori shelled out the $500,000 (and allegedly committed a couple of felonies in the process) …that’s pretty dumb … and, at least some of everybody’s “smarts” comes via their parents DNA. So, it seems reasonable to conclude that the girls aren’t the sharpest knives in the drawer. Does that mean that they aren’t “qualified” to attend USC? Why are Asian-American students dominating “elite” schools? No, they don’t buy-off sports coaches and abuse standardized testing procedures. Thomas Jefferson High School for Science and Technology (“TJ” for short), is a selective DC-area magnet school designed to provide an elite, high-tech education for the most academically gifted students in Northern Virginia. The school offers rigorous study in advanced college-level offerings like electrodynamics, neurobiology, and artificial intelligence. High octane academics, for sure … offered to the best and brightest. The school’s newly accepted Class of 2022 is 65 percent Asian, 23 percent white, five percent Hispanic, and two percent black. 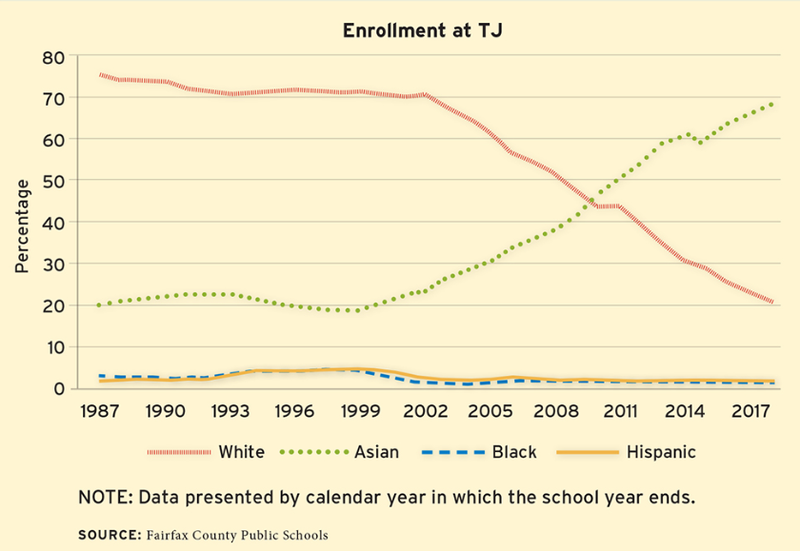 20 years ago, the concern was that Black and Hispanic representation at TJ was less than half their demographic mix in Fairfax County – the “feeder” county. Several initiatives were launched to increase Black and Hispanic representation, including early identification and proactive outreach to high potential minority children; supplementary in-school and extracurricular programs to teach and mentor them; and more ready access to prep and gateway courses such as Algebra. While undertaking those initiatives, something unexpected happened. The numbers of Black and Hispanic students applying and enrolled at TJ remained stalled at the pre-initiative levels. So, that’s still a concern. But, during the same time period (and unrelated to the minority initiatives), the number of white students declined sharply … and the number of Asian-American students has soared. Before climate change, there was the “Population Bomb”. And, there are remarkable similarities. Recently, in one of her articulated streams of consciousness, AOC warned that we all would be toast in 12 years if global warming wasn’t arrested. Time to metal-cube our SUVs and mass-slaughter the bovine-methane creatures, right? While AOC’s warning may come to fruition, I’m betting the over on the 12 years … in part, because it fits a pattern of hysterical unrealized doomsday predictions. For example, circa. 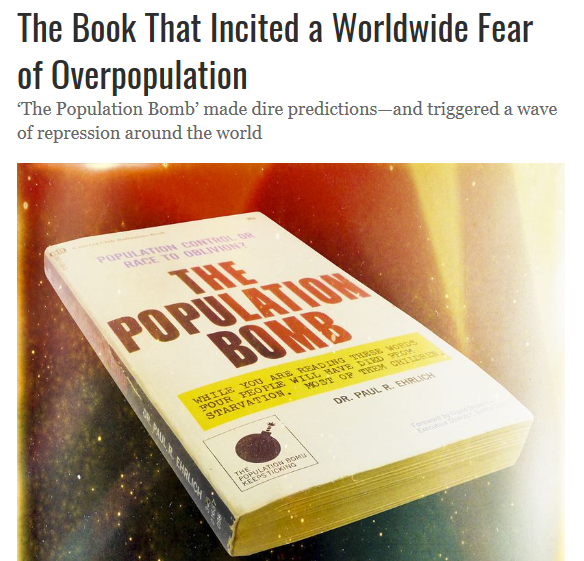 1970, Prof. Paul Ehrlich (Stanford University) wrote Malthusian-inspired book: The Population Bomb. The book became a runaway “scientific” best-seller. The battle to feed all of humanity is over. Hundreds of millions of people are going to starve to death. All of us will face mass starvation on a dying planet. While their were some deniers, demographers agreed almost unanimously with Ehrlich’s doomsday prediction …. For the record: I’m neither a denier nor a zealot … so, according to British writer (& phrase-coiner) Matt Ridley, I’m a “lukewarmer”. Since AOC rolled out her Green New Deal, I’ve heard many left-leaning pundits spouting the oft-repeated but unsupported claim that 97% of scientists agree that climate change (nee, ‘global warming’) is real, man-caused and catastrophic. Reason enough to flashback to our long ago post debunking the 97% malarkey. Reason #1 … Unsettling Science … I’ve gotten cognitive whiplash from “Ice Age” u-turning to “Global Warming” … which was slowed by an “18-year Pause” … and then wrapped in a catch-all “Climate Change”. Reason #2 … Al Gore and his doomsday prediction … in 2016 we passed his point of no return towards a true planetary emergency … without the planet melting or exploding … and with Manhattan still above water (I think). My 3rd reason: The “97% of scientists” baloney. Case closed, settled science, right? 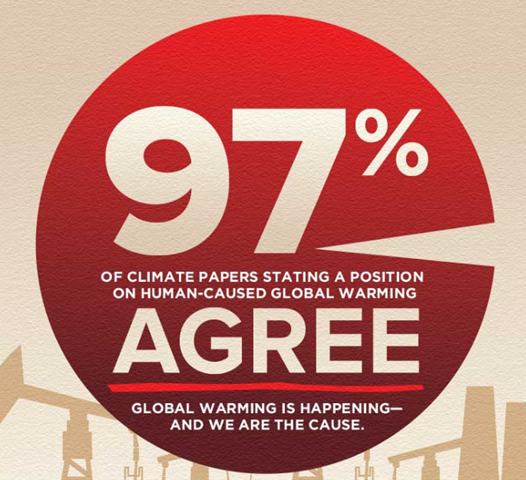 Can you think of any issue that garners 97% agreement? My bet is that 97%% of “scientists” don’t even agree that smoking causes cancer. Pick your issue … 97% … really? Doesn’t smell right to me, but maybe climate change the exception to the rule. 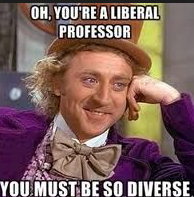 Conservatives are fretting (rightfully) that Roberts is trending liberal. 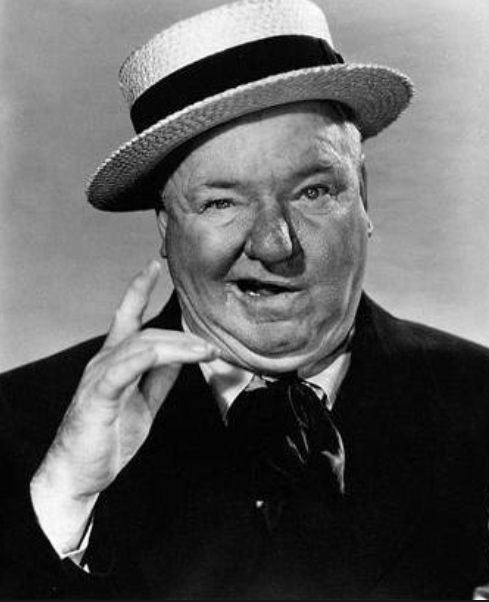 Let’s put SCOTUS political leanings in context…. 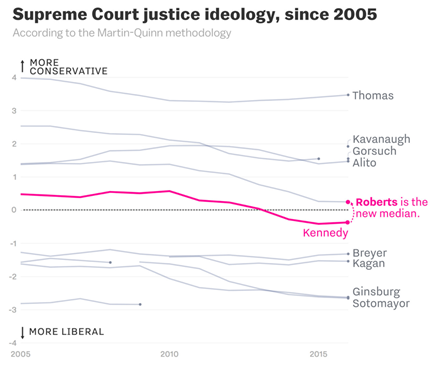 Political scientists Andrew Martin and Kevin Quinn developed a measure to calibrate how liberal or conservative SCOTUS justices are … based on their rulings. As near as I can tell, the measure is uncontested by either ideology. Frosh Congresswoman ilhan Omer set off an anti-Israel, anti-Semite bruhaha last week. That was broadly covered by the MSM. But, the MSM has largely ignored the Congresswoman’s interview with left-leaning Politico. We can’t be only upset with Trump. His policies are bad, but many of the people who came before him also had really bad policies. Who was she talking about? Bridge champ busted for doping … say, what? Flashback: Last year, during the the 2018 Olympics, a husband & wife mixed doubles curling team from Russia was stripped of their bronze medals when he tested positive for performance enhancing drugs. You read that right: In the brute of all brute sports … CURLING! The draconian action by the Olympic Committee struck me as a bit puritanical overkill. 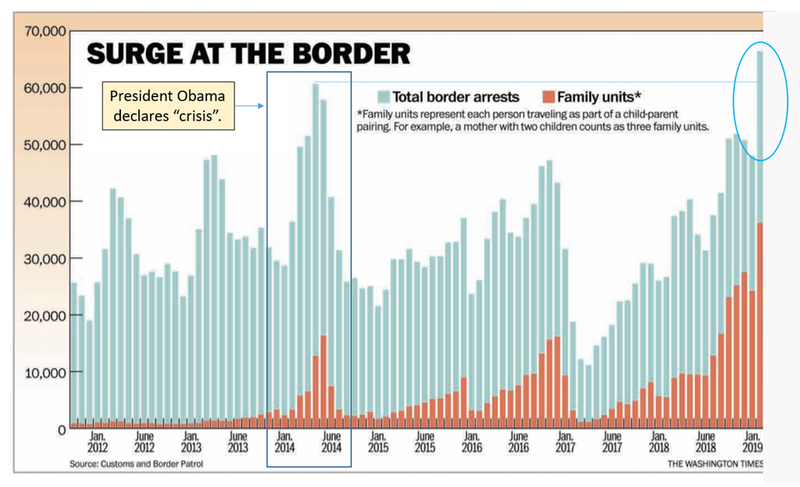 Dems say that illegal crossings have declined in the past couple of years, evidence that that there is no crisis … and certainly no national emergency. That narrative seems to have hit a bump in the road. 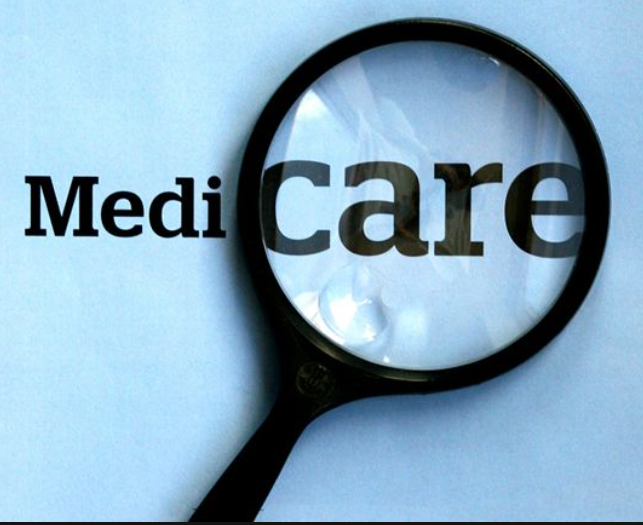 After paying Medicare taxes for years, weren’t the benefits supposed to be free? Yesterday, we argued that Medicare’s payroll taxes can thought of as prepaid premiums … that amortize to the equivalent of $10,000 per year over a retiree’s post-65 life span. And, we pointed out that the prepaid premiums are just the tip of the iceberg. Once retired, the Feds collects additional annual Medicare premiums. This may surprise pre-retirement folks who think that they pay in during their working years, but then get “free” healthcare insurance when they retire. Ouch: The (personal) economics of Medicare. Over the years, I’ve anteed about $250,000 into the Medicare tax kitty. And, you may have thrown in more than you think! Motivated by Medicare for All hype coming from far-left-leaning Dems presidential candidates, I finally took a serious look at the buckos that I’ve thrown into the Medicare kitty over the years. I’d like to say that I was surprised, but I really wasn’t. 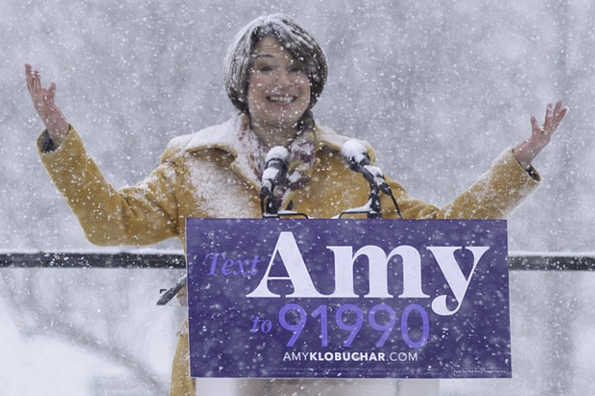 … AOC may be holding the matches, but the GOP tax reform provided the kindling. Last week, I whined that – though I’m getting a tax refund this year – my income taxes went up in 2018. I’m ok with that since I conclude that the corporate cuts turbo-charged the economy and the stock market … and my IRA account gains are much larger than my additional taxes. But, I do have a mega-concern that I started touting way back in 2017 when the GOP tax reform was being crafted, debated and passed. My mega-concern is the long-run tilt in voting dynamics, in the new age of the Green Dream, Medicare for All and Guaranteed Minimum Income (for those who are unable or unwilling to work). Remember Mitt Romneys ill-timed observation about “47% of Americans”. No, they weren’t Hillary’s “deplorables”, they were simply the folks who pay no Federal income taxes. Well if the GOP tax plan got enacted … the 47% is still alive .. and now on steroids..
And, it’s not just the tidal wave of online programs or ballooning college tuitions. Grawe’s central thesis: Birthrates have plunged 13% since the Great Recession … and that “birth dearth” will cost America 450,000 fewer college applicants in the 2020s. Here are some of the specifics…. Can they muscle up to pull us together? A lot of punditry these days about American Tribalism … categorizing people by common interests … usually with a demographic slant (i.e. race. gender, and location – urban, rural; coastal or Heartland). Those “tribes” are usually characterized as warring factions with little in common. 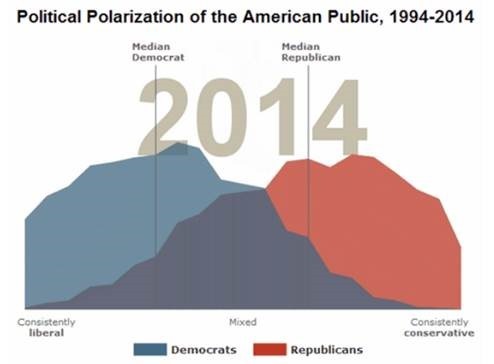 The result: sharp differences and apparently intractable political polarization. An organization called More in Common did some research that takes a different cut at the situation. These days, all the publicity is about people who are getting smaller tax refunds this year … clear evidence, they say, that Trump lied about cutting middle class taxes. People seem to easily confuse “refunds” with “taxes paid”. Of course, the relevant measure is “taxes paid” … and, most middle-classers are paying less in taxes. But, behavioral economics and psychology kick in … and, people wrongly focus on their refunds. Last year, I had to write a check to the government. Ouch. This year, I’m getting a statistically insignificant refund. Nope … because my taxes went up. My income stayed about the same … so the increase was due to the tax law changes. When I drilled down on the causes & effects, I got a few surprises…. 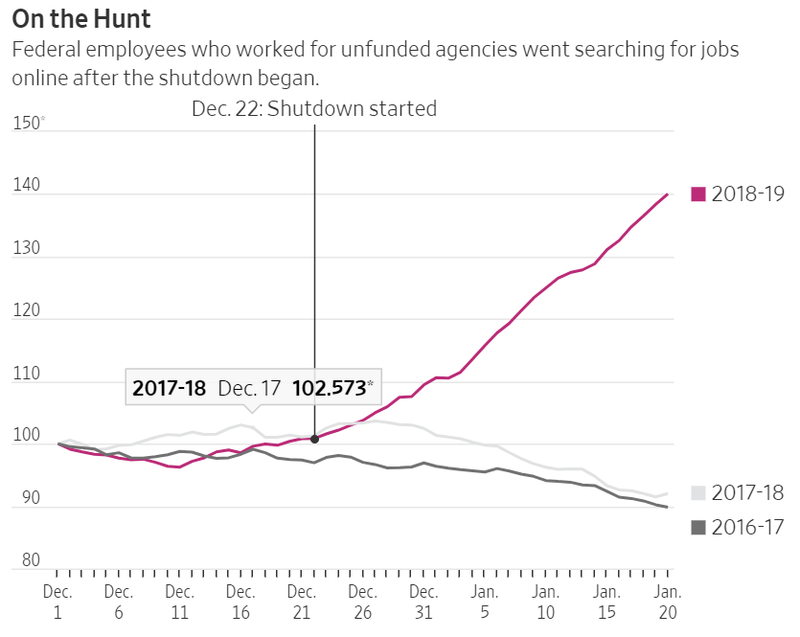 Why the Senate won’t rescind Trump’s emergency declaration…. Yesterday, we argued the case for Trump prevailing legally. Again today, let’s set aside aside the question of “should he do it?” … and focus on “can he do it?”. Specifically, will Trump survive a Congressional move to Undeclare his national emergency? OK, Pelosi is going to push through a resolution to “undeclare: Trump’s national emergency. Dems will vote in lockstep, and the bill will will be passed over to the Senate. Dems are ecstatic that a handful of GOP Senators are hinting may jump party lines and that enough my vote aye on the undeclaration. Will Trump’s national emergency gambit survive legal challenges? Loosely written laws and established precedents are on his side. 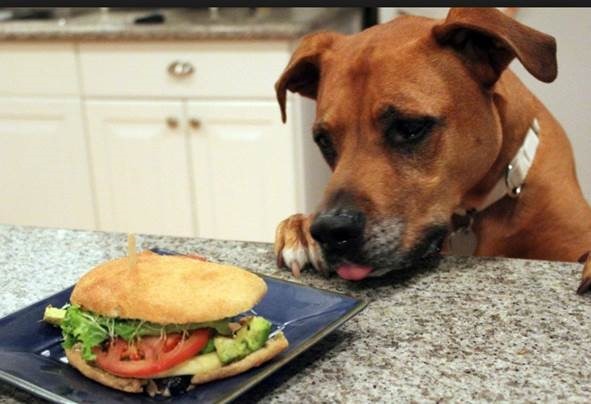 For a moment, let’s set aside aside the question of “should he do it?” … and focus on “can he do it?”. You can (and should) read the whole article. It weaves legal specifics with tight logic. Megan McArdle is a Bloomberg columnist who usually writes on the intersection of economics and politics. 1. Be kind. Mean is easy; kind is hard. Making yourself feel bigger by making someone else feel small takes so little skill that 12-year-olds can do it. That analysis ended in 2014 … showing a double-humped distribution that had been separating over the past decade or so. The humps have spread further apart … indicating sharper polarization. Also, note the vanishing middle (the dark blue on the graphic). The hardening political divide in Washington remindsme of an interesting analysis that NBC’s Chuck Todd did a couple of years ago. It’s no secret that American politics has become increasingly – and maybe, irreversibly – polarized. Of course, Obama lays blame on Trump and his band of ignorant deplorables. Polarization is no longer just polluting the system — it’s paralyzing it. 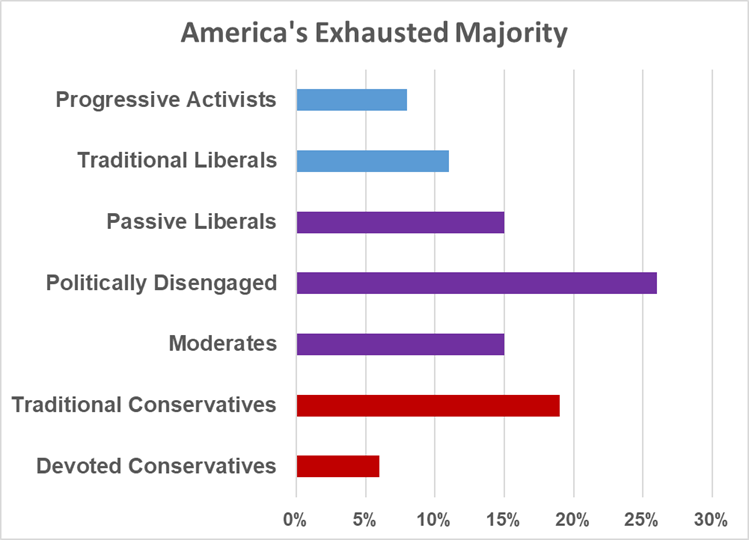 The deepening divide between the right and the left has largely hollowed out the center of American politics. Gone are the politicians who once occupied the large “middle” and the voters who once gravitated to them. 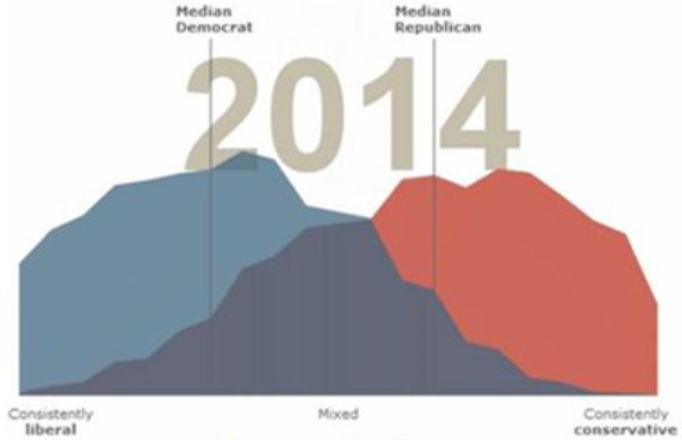 The Pew Research Center has tracked party identity and ideology for decades. One way they do it is by scoring the Republicans and Democrats on a 10-item scale of political values. Democrats cluster to the left, Republicans cluster to the right. 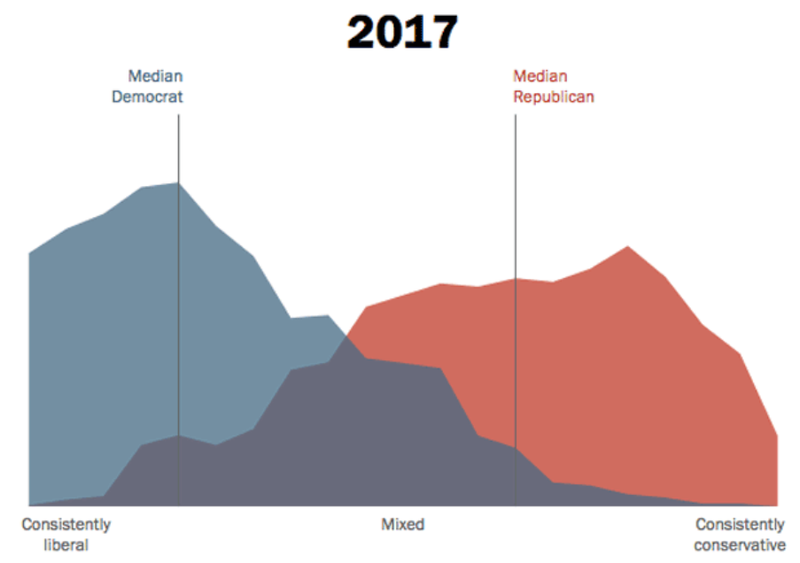 There is less than 10% in each party leaning ideologically to the left (or right) of the other party’s median. What is this “grit” that she’s talking about? Together, we can reclaim our building heritage. We will build gleaming new roads, bridges, highways, railways, and waterways across our land. And we will do it with American heart, American hands, and American grit. So, what is this “grit” that they’re talking about? Last week, we posted Rasmussen poll results indicating that Trump’s approval got a bump after the SOTU. Since Rasmussen leans right and doesn’t use classic interviewing techniques, it’s easy for some folks to dismiss the numbers. But, Gallup is the gold standard of polling, right? Well, the Rasmussen conclusion seems to be corroborated by Gallup. 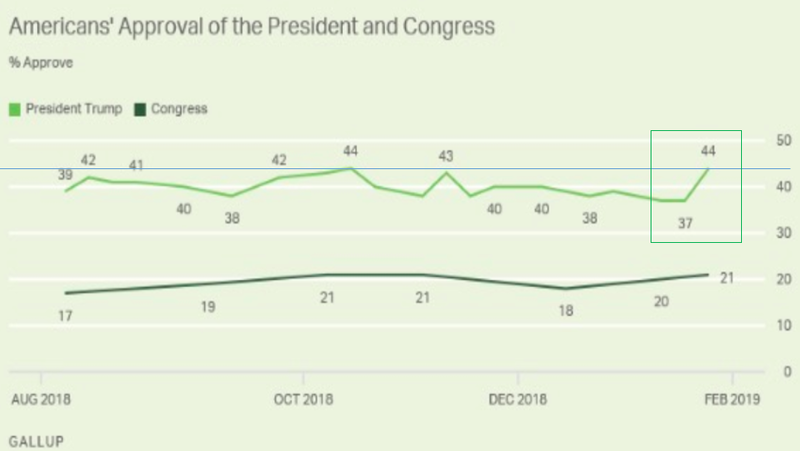 The most recent Gallup survey indicates that (1) Trump has more than bounced back from the shutdown dip, and (2) His approval – which is at a high water mark – is double that of Congress! Over the past couple of weeks I’ve put up a few posts addressing the border wall legislative mess. To get you ready for weekend cocktail party debates on “the bill” and National Emergency, I’ve pulled together the posts into a sort of border wall primer. For openers, Dems like to say that Trump doesn’t have a plan … or that his defacto plan is “a concrete wall from sea to sea”. Yes, the “build the wall” campaign rhetoric provides fodder for the sea-to-sea claimers, but Trumps plan (yes, there is one) has evolved to about 225 miles of steel slat barriers, strategically placed to slow the inbound flow across the borders and channel border crossers to bolstered “ports-of-entry. See Cutting to the chase: What exactly is Trump demanding? But, walls are ineffective and fundamentally immoral, right? In technical terms. a binary switch got flipped. Trump’s next headache: ‘Unrecognized’ tax-cut benefits. 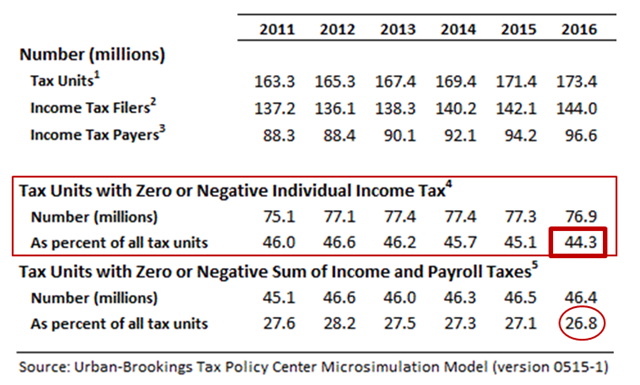 Will 143 million households notice that their taxes have been cut? Regrettably, our prediction seems to be coming to fruition. 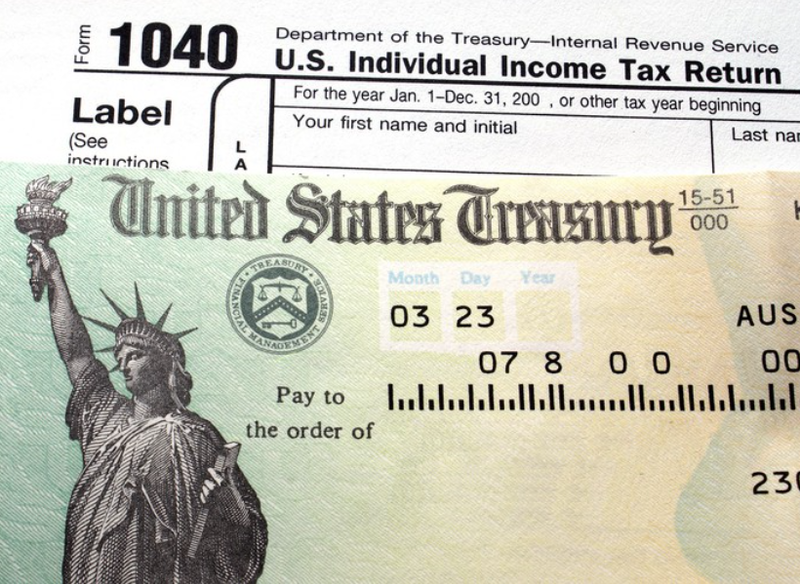 There have been a flurry articles citing tax preparers who are warning that, tax refunds will be smaller this year … lower in average, with fewer people getting refunds. Most recent IRS data support that claim: average refunds are down 8.4% from this time last year. That’s a big deal … and, will be a big headache for President Trump. May put a new paint job on conference committee negotiations. First, a disclaimer of sorts. Rasmussen skews right and its surveys are scoffed at by most traditional pollsters because they’re conducted without human contact … folks just answer questions via touch tone phone responses. That said, I’ve found Rasmussen to be a good predictor on sensitive issues when people are reluctant to tell somebody what they think, but are willing to interact with an impersonal computer. West Virginia: Rebounding … and considering a name change. No state suffered more from the Obama regulatory assault than West Virginia as coal production and business investment plunged. 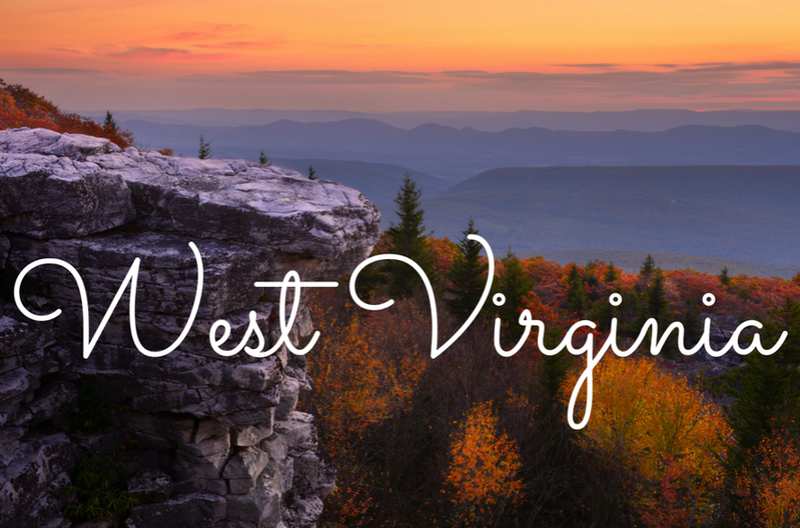 West Virginia’s revival started in early 2017 as coal and natural-gas production picked up. Exports and the Trump Administration’s deregulation have lifted the industry.